It is our desire that each man successfully finish Basic Training and come away with a firmer foundation mentally, physically, and spiritually. In order to set you up for success we have put together a preparatory program to guide you in weeks prior to Basic Training. You may start it at any time before Basic Training and you do not have to do it at the pace or sequence that we have prescribed. This preparatory program is not a requirement! 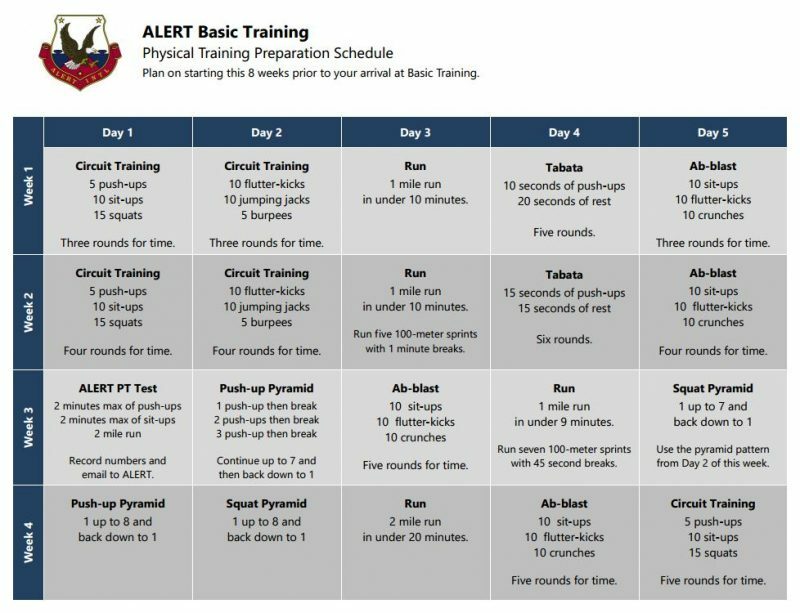 Plan on starting this 8 weeks prior to your arrival at Basic Training. If you find the PT is too easy or too hard you may adjust them as needed. They are just designed to help you. Run five 100-meter sprints with 1 minute breaks. Run seven 100-meter sprints with 45 second breaks. Use the pyramid pattern from Day 2 of this week. 2 mile run in under 20 minutes. Record numbers and email to ALERT. Run eight 100-meter sprints with 45 second breaks. Run eight 100-meter sprints with 30 second breaks. Run ten 100-meter sprints with 30 second breaks. We have found that it is extremely helpful to have at least the 1st chapter memorized before your start date of Basic. Start memorizing the book of 1 Peter in the King James Version. The time you spend working toward that goal beforehand will significantly ease the pressure of weekly deadlines once you arrive. This recommended program covers 1 Peter 1 & 2 by giving you a verse a day for 8 weeks. Items on the Basic Training Packing List must be purchased and brought with recruits to Basic Training. Many of these items may be purchased through the ALERT Store. All items are required, regardless of season. All necessary uniform items will be provided. See Basic Training Issued Items on page 2 of the packing list.